In a genre which seems to be evolving and branching out by the year husband and wife duo Keith and Cathy Latinen, also known as Empire! Empire! (I Was A Lonely Estate), have been an ever reliable constant. Over the last eight years they’ve been consistently releasing music, the high point of which was (and still is) the duo’s excellent debut full-length What It Takes To Move Forwards, a spellbinding epic. Five years on their second LP You Will Eventually Be Forgotten picks up where their first left off, and it’ll likely go down as one of 2014’s finest emo releases despite not being quite as memorable as the duo’s 2009 release. Empire! Empire! have been around for a while now, and if you’re even slightly familiar with their music you’ll likely know what to expect from their second album. Like the rest of their discography You Will Eventually Be Forgotten is full of sad songs which are much more than just sad songs. The tracks here are incredibly personal and just as heartfelt, as Keith Latinen’s nasal, keening emotional vocals ride alongside melodic, crisp clean guitars which form the backbone for most songs. It’s affecting and dreamy emo, brimming with childhood whimsy and adult reflection in its lyrics, which take focus over the instrumentally side of the record. Stories of friends and family are littered throughout, and the record often dwells on the more painful moments which are a consequence of having either. Lyrically it isn’t as strong as their debut, but it’s still very thoughtful and well-written despite being occasionally transparent. From the offset you’re invited into the Latinen’s world, be it as a bystander at the wedding and same-day car crash which saw them become ‘the Latinens’ (Ribbons) or as a spectator to the holidays of Keith’s youth (A Keepsake). You’re right there with them, nestled inside the warm arms of a record which encourages complete isolation from the world outside of its opening and closing notes. It’s immersive, and like the album art it’s best listened to alone. You aren’t necessarily alone when listening to it, but it’s soothing through its isolation, a blissful sort of escape – albeit an escape into someone else’s troubles. Two songs in you’re two car crashes deep, and towards the end the content shifts from a road-trip to a funeral, and then to an anniversary and another death within the space of a few minutes across the excellent If It’s Bad News, It Can Wait and It’s So Much Darker When A Light Goes Out Than It Ever Would Have Been If It Had Never Shone. Every song is moving in its own way and You Will Eventually Be Forgotten, like its title, is blunt, but that’s the reality, and Latinen uses this reality to make his songs relatable, because to a degree everyone can connect with a sad song. It’s what continues to make the genre increasingly important, and Empire! Empire! stir up emotions frequently at either end of the spectrum, with the bleaker moments often bringing about some kind of cathartic release. You Will Eventually Be Forgotten‘s biggest strength, and also its biggest weakest (potentially) is how familiar it all sounds. Empire! Empire!’s music is quite unique, but for the last half-decade or so it’s stayed rooted within the borders the band established very early on. Not a whole lot has changed here in that regard, and after a few playthroughs the record may become quite tiresome – it’s nothing you haven’t heard from the band before – but that doesn’t necessarily dull the charm it carries. Some listeners won’t like the similarities, and I’ll admit that towards the end the record does grow repetitive (despite the final few songs being its best), especially when compared to preceding releases, but the extent to which that bothers you will likely depend on how you value the band’s music thus far. If you’re alright with forty minutes of the sound the band have always played then it won’t be an issue – you’ll love this. If you’re looking for a change, or at least something slightly different you won’t find it here, because You Will Eventually Be Forgotten is trademark Empire! Empire! through and through. Personally, I’m more than okay with that. There’s a reason I love the duo’s music, and that reason still exists plentifully on their second full-length. These are depressing songs which don’t necessarily inspire an equally depressed response. There’s uplifting qualities about songs like A Keepsake; there’s something highly relatable about the story it spins, and it makes me remember walking along beaches as a child and looking for interesting stones that I could give to my mother to add to the unusual jar of them she kept on a windowsill at my Grandmother’s house – it stirs up memories dependent on the listener. At times the lyrical content is too specific, making it tough to empathise with, but generally speaking I expect there’s something for everyone here. Not everyone’s capsized a boat on the lake near their house (Stay Spirited), but most have spent days in childish reverie dashed with a few unfortunate events, or had a job they felt was beneath them (Things Not Worth Fixing). You Will Eventually Be Forgotten encourages thought whilst leading you by the hand, and it preaches that sometimes it’s okay to wallow in the past; there’s comfort in memory, and there’s an immense amount of comfort to be taken from it. This is a wintery warm album; one that sounds cold in terms of its content but also smoulders with the fire created by a pleasant, yet far away nostalgia. Latinen can’t undo what’s he sings about, can’t change the past, and he understands that and instead aims to find some sort of profound beauty in the sadness these memories stir within himself. This is a sad release, but it’s also happy in a way which is difficult to pen down. Listening to You Will Eventually Be Forgotten you may not understand what it’s trying to tell you, but you’ll feel it, perhaps most so on closer The Promise That Life Can Go On No Matter How Bad The Losses, which isn’t quite as optimistic as its title suggests. It’s stripped back in comparison to other tracks, a piercing guitar the main accompaniment to Latinen’s tale of being away from home on New Year’s Eve, which he delivers with vocals reminiscent of Ben Gibbard of Death Cab For Cutie. As the song reaches its final minute drums come in, and the song reaches a weary peak as it paints vivid pictures with gorgeous layers. It doesn’t go above and beyond as a lot of closers tend to, but it’s still very affecting, a sublime piece of music. As is the case with this song there’s a reliance on imagery; the album is rife with similes and attention to small details, and it all comes together brilliantly. The instrumentation is powerful even when drifting and Latinen’s delivery is excellent, slightly more polished than on past releases, although he is slightly drowned out on You Have To Be So Much Better Than You Ever Thought and inspired second track I Was Somewhere Cold, Dark… And Lonely, getting lost in some of the climbing highs of the record. At its best You Will Eventually Be Forgotten is a frank, absorbing reminder of what it is to be alive, and over the years I’ve found that this reminder is best found in music of this nature, and very few artists capture life in a song as well as Empire! Empire! do, and thankfully there’s eleven of them here to bask and find solace in. This is a record which feels emotion in its purest form, I found myself incredibly moved throughout, and I had to join my Dad downstairs to watch a few hours of rugby to put myself back together again after my first listen – a task that was made much harder by the voice in the back of my head telling me that I should tell my father that I cared about him a great deal, just in case of a stray SUV and a patch of black ice come the Winter. You Will Eventually Be Forgotten is a very rare record in that, to an extent, it makes you ponder and appreciate life, forcing you to take a step back and really acknowledge the places you’ve been and the people you shared those moments with. For forty minutes or so you’re seeing those moments through someone else’s eyes, and as You Will Eventually Be Forgotten fades out you start to see them through your own. Perhaps it’s a strange experience to take from music, but it’s perhaps the best quality of Empire! 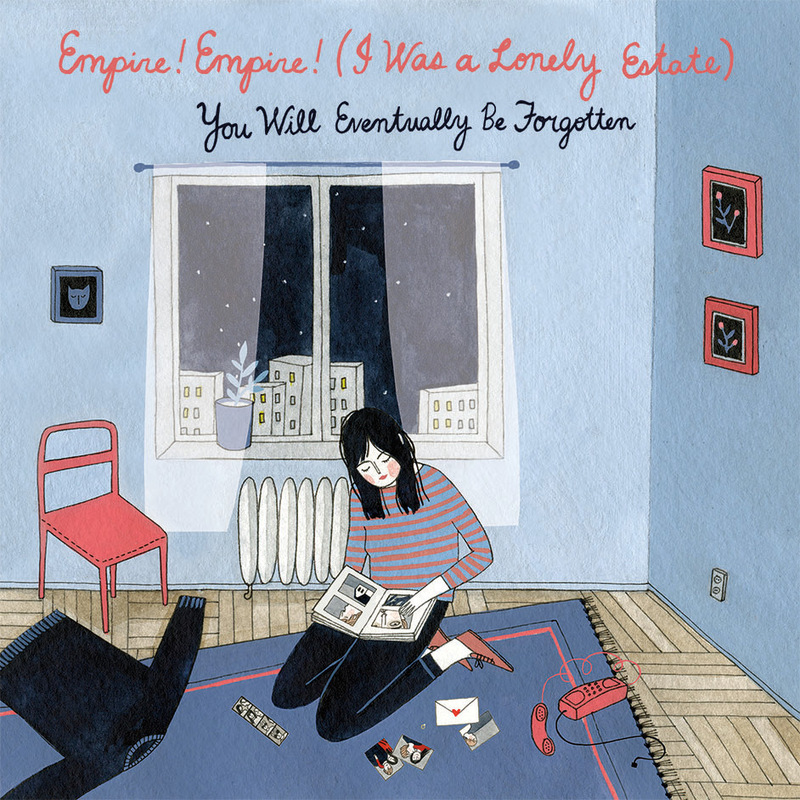 Empire!’s music, and it’s almost certainly the most wondrous aspect of it. Savour You Will Eventually Be Forgotten; it’s very, very special, and it’s also damn near essential if you’re a fan of the genre.